Multiplex for iPhone and iPod touch 2.1 is rolling out to the App Store! Multiplex for iPhone and iPod touch has a slightly overdue refresh: Version 2.1 is in the App Store — well, some places. It may take a bit to get to you, but it is coming! As users of the app know, it has been a little dodgy lately. What’s happening is, some strip images are being loaded and the app doesn’t recognize that it has finished downloading. It’s a really weird bug, because it only started happening recently, and it only affects certain strips—but if the current strip in the strip view is affected, the app will not load. 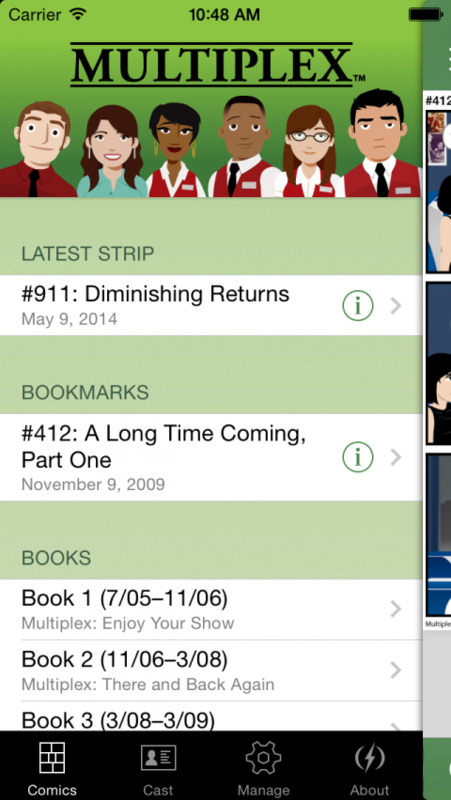 Version 2.1 includes a completely rebuilt-for-iOS 7 strip view that fixes the issue. It also sports a UI refresh for iOS 7 (just in time for iOS 8!) and fixes a couple of other minor bugs, like one that would cause the Notes from the Manager to fail to load occasionally. The bad news is that the app will only support iOS 7 now. Jelly (the developer) and I don’t have the resources to spend more time tracking down what’s actually causing the problem—we’ve tried and failed; it’s a free app; and Jelly is donating his time to make it exist in the first place. So, I’m sorry, iOS 6 users. You will need to upgrade to iOS 7 to use with app with any confidence. You can delete and reinstall the app and it should start working again, but as I said, some strip images may cause it to break again, and we have not been able to figure out why. Literally nothing changed in the code or in the way that I’ve prepared the images. Hopefully more features will come soon! If you use the app, please review it! And if you find any bugs, please let us know! We can’t fix it unless we know about it! Posted in Trailer Watch | Comments Off on Multiplex for iPhone and iPod touch 2.1 is rolling out to the App Store! Those of you playing along at home will know that thanks to the Patreon backers passing the $600/month Milestone Goal, I’m redesigning the website to remove all third-party ads entirely and to accommodate larger strip images. There is good news and bad news about that, though. First, the vegetables: The complete site redesign is going to be a little delayed. It’s a bit more work than I have time for, because of grad school, unfortunately. But I will get to it as soon as possible. BUT… the good news is that as a temporary measure, I’ve removed the third-party ads from the comics pages (including the homepage), although they remain on other pages of the site because removing them would break the site layout. They’ll disappear in due time, though. This temporary redesign was the simplest solution, and it removes the ads from the vast majority of the website. I’ve also increased the size of the current — and future — strips to 900px. That’s 25% bigger! I’ll be updating the older strip images, too, as time permits. This benefits ALL Multiplex readers, whether they read on the website, the RSS feed, or the Multiplex iOS app. The Milestone Goal was announced for 900px images, but I’ve settled on 960px wide for the new site. 900px is just the largest I can make them with the current site design. Other features of the new website include a responsive layout (to play better with mobile devices) and retina display detection (to provide even larger images to displays capable of showing them). Thank you VERY much to all of the patrons at Patreon for helping make this happen, thank you to my programmer Daniel Farrelly for devoting so much of his time and work to Multiplex, and thank you for reading! 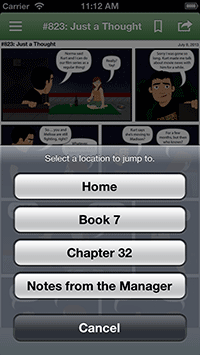 UPDATE: I’ve updated all of Chapter 34 to the 900px size now.